Last Wednesday, a draft anti-terrorism law was approved by Egypt’s cabinet that would make “publishing news that contradicts the official version of events in terrorism-related cases a crime punishable by prison sentences.” The law has already been approved by the Cabinet and State Council, and only needs approval from President Abdel-Fattah el-Sisi, who passes all laws in the absence of a parliament. The draft law comes in the wake of one of the worst militant attacks in several years with at least 70 people killed. The law would effectively make it illegal for journalists to report facts that go against official government statements, a stifling move for domestic and foreign reporters alike. Additionally, provisions of this law would give police even greater power to imprison journalists in the country, a growing concern given that four journalists were arrested in the last week and 18 journalists were arrested in June. “The crackdown on the press is deepening at a time when the public needs independent reporting on the security threats that Egypt is facing,” said Sherif Mansour from the Committee to Protect Journalists. 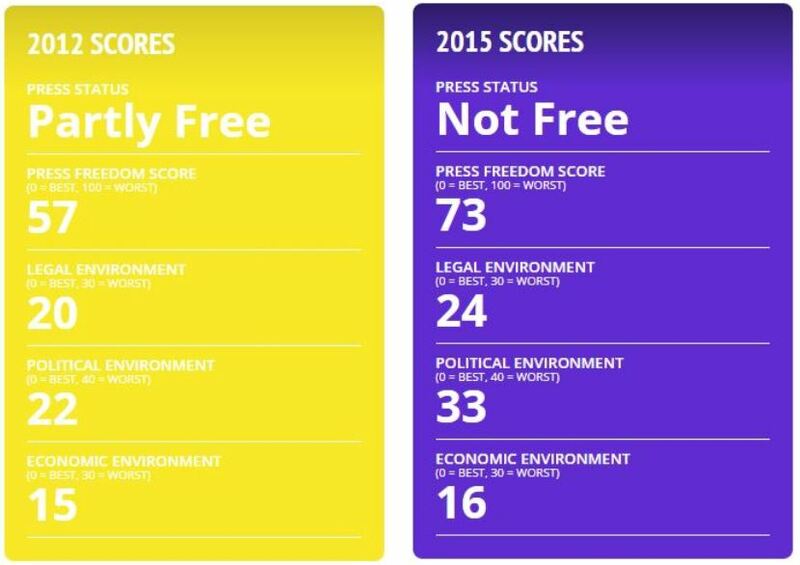 Press freedom has rapidly declined in the past few years according to Freedom House’s Freedom of the Press Survey, falling from Partly Free (57) in 2012 to Not Free (73) in 2015. Activists around the world are warning that that this type of law could stifle free and independent reporting and have raised concern that the government is taking advantage of the shock of multiple attacks in the past few weeks. While many journalists on the ground are actively speaking out about the government’s repressive actions, it is unlikely that journalists and media outlets will have the capacity to organize resistance or repeal of this law. Unfortunately, many groups like the largely defunct Egyptian Journalist Syndicate, an organization tasked with organizing and protecting Egyptian reporters are financially dependent on the state and have proven unable to mobilize against previous attempts at media crackdowns. As the situation in Egypt evolves, it is clear that international organizations will need to closely monitor the actions of the government, particularly when it comes to the media. With other high profile cases in Egypt, there is no longer any doubt that the government is acting against the interests of a free and independent media.